It works great after 20 years of dry thumbling, now wet thumbling its faster and the cases ar cleaner inside is clean to in less then 2hours. Works perfectly, but the packaging could be improved: during the transport, the bag had opened and there were pins everywhere in the package. The stainless steel works great! The inside of the cases are clean within 2 hours. It works faster in combination with hot water and dish wash soap. It saves a lot of time fore me. And there is no dust residu in the cases. A great way to clean cases. Stainless steel pins, cylindrical in shape and magnetic. 3.5Lbs of media is all that is needed for the CED Brass Tornado, 3.5L drum - 17 lb capacity tumbler. This media is magnetic, allowing it to be picked up easily with magnets. 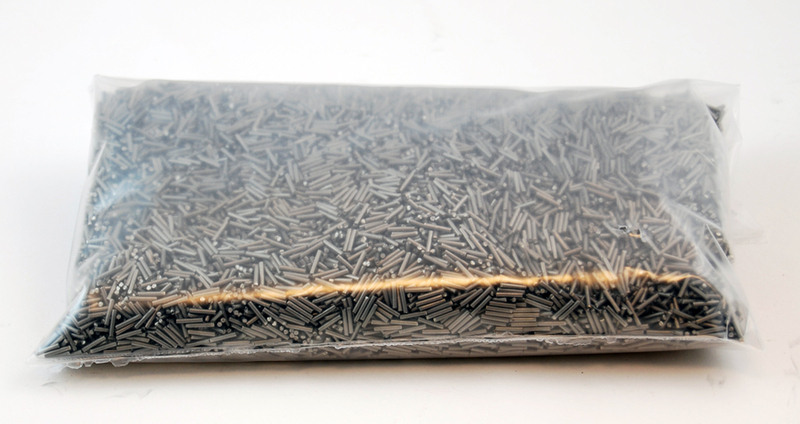 Stainless steel pellet pin media is designed to work best for polishing brass, but will work with many other applications. Pins will pass through the flash holes, cleaning the primer pocket like new. Will not work-harden brass. Pins don't wear out so they will never need to be replaced unless lost during the rinsing process. This media will work for ALL case sizes. Requires a hexagon style drum. Will NOT work in Vibratory Style systems. The media size is .047"x.255". This will work for all caliber sizes and it will clean the primer pockets the best. Each pack weighs 1.6kg / 3.5lbs.